Being an adventurer is a dangerous line of work, but the rewards are well worth the risk. The smartest adventurers never go it alone—they not only bring allies to help explore the dangerous reaches of the world, but also seek aid in the form of support, supplies, and secrets from powerful organizations. With such a group to serve as a guide, an adventuring party's chances for success have never been better! I didn’t expect to find such a connection to this book, having not played the APs that touch on the various groups contained herein (and also just generally hating hellknights), but hoo-boy was I surprised. The writing is lovely, the characters and organizations are vivid, and the player options are exciting and well-designed. The gray maidens chapter in particular blew me away in particular. The mechanics of their player options are a pedect combination of flavorful and mechanically effective, and have the added bonus of fitting together into a coherent and effective character build. These days, it can take a lot for a book focused on new feats, spells, etc. to impress me. I’ve reached a saturation point. There are so many options now that I can’t keep track of them all, and most new ones get forgotten soon after I read them. Adventurer’s Guide is one of the few books that stays in my mind and keeps pulling me back to it. I can’t recommend it enough! The title is misleading, as was posited by many during the product preview, and mealy-mouthedly denied by Paizo. This is a Golarion book, period, which has no place in the core line, and the contents consist of an insultingly large percentage of reprints. Shameful, really. Soooo...I'm going to say that I obsessively collect Pathfinder products, and as such, much of this material is old hat for me. Emphasis here is 'for me.' With that said, I want to examine this in a vacuum. The artwork is good, but then, it's been good. It serves more as a 'Faction Guide 2' for me than anything, giving some details about the various organizations, class options, feats, and ties. In particular, though, I like that I don't have to flip through two or three books to get character options for the factions. Hellknights in particular were always a pain due to how diffuse their rules were. I can now hand this book to a person and say "here ya go. Here's some ideas of factions in the setting." One drawback, as has been mentioned, is spoilers for the various APs. While I use those sparingly, it can be somewhat problematic, and I'd suggest steering players away from this if that's the case. Overall, it's a decent enough product. If you're new to the setting, it's worth picking up as a nice collected list. If you're old hat, a few options inside are interesting enough, and a few setting updates are worth examining. I'm particularly interested in the Lantern Bearers' new direction. This book helps clear up and collect a lot of older material, balanced now with other released material for GMs. It also adds in a wealth of new material for factions of Adventurers across Golarion. A solid collection of old and new under one singular heading. Some factions contain major spoilers, making it hard for a GM to just pass off to players who may be playing certain APs. Inclusion of multiple races and creeds and even transgendered factions and npcs in multiple parts of the book. This book really fleshed out some factions which had little to no crunch. Certain feats are fun but others are less the useable. A feat that allows a bonus on maneuvers but doesn't stack with improved maneuver feats? Those are the ones that help avoid AoO. So what's the point of the feat? Additionally a heads up to some people about the amount of reprints would have calmed an angry section of customers. Honestly I love the book and can't wait to try out some of the new material and some of the updated versions of older (and due to other books options more unbalanced) options. When you get past the salty tears of angry optimizers, you're left with a fine entry into the guides section with Inner Seas flavour. Announced for May 2017! Image and description are not final and are subject to change. Meh, not a fan of most of these organizations. Also I prefer my RPG line to be campaign neutral. Huh. So they're folding the various organizations into the setting-neutral book series? Well, that'll be neat! Looking forward to the Magaambya in particular! Really interested in seeing what's done with these organizations to bring them more up-to-date with modern Pathfinder. Many of the prestige classes linked to them show their age these days - I look forward to seeing what innovations are shown! I am tired of archetypes and have only liked one prestige class. New feats, spells, and magic items are not a selling point to me anymore. While there are some things in those categories I am looking for, I have given up asking for them. I am really not interested in class abilities tied to specific organizations. Especially ones I have no interest in or are just sick of seeing in game. The only things I am still looking for are more class abilities/options like kineticist elements/wild talents, bloodrager/sorcerer bloodlines, oracle curses/mysteries, witch hexes, rouge talents, rage powers, alchemist discoveries. I would be happy for a hardcover book with nothing but this kind of stuff. So this is a campaign setting book "Inner Sea Factions" with the cover changed to make up for the fact that the RPG line is light next year because all of the RPG staff are busy with Starfinder. I bet that this was originally in the campaign setting line and has been moved. Don't sell us a spade and call it an apple. I like apples, and spades are useful in the right circumstances, but one is not the same as the other. 1. The books title in no way matches its contents. 2. An RPG line book should give us tools for creating OUR OWN organisations. A Campaign setting book tells us about YOUR organisations. 3. All of the RPG line books have been added to the PRD, I am pretty sure that this will not be. I suggest that this book is wrongly categorised, and that Paizo should reconsider where it belongs. The Adventurer's Guide will be appearing here officially soon. Sometimes with the way we solicit this information to distributors, sites like icv2 can "leak" material before we've had a chance to get it up on our site ourselves. Some staff illnesses and other boring, unimportant day-to-day business stuff contributed to us not having our ducks in a row on this book this time, but I'm hoping that all gets sorted out by Monday. The Adventurer's Guide IS a Pathfinder RPG book, published in the Pathfinder RPG line. This is a bit of a departure for us because the book WILL have more "Golarion" content in it than a regular book, but the emphasis is largely on character options, equipment, and other rules elements aimed at player characters, not on detailing the precise history of each of these organizations. Organizations and power groups pose an interesting creative challenge for us when it comes to maintaining a strict wall between Campaign Setting and RPG line material. We started this book thinking "we should do a cool book with tons of character options related to different groups players can join." From there we faced a key decision: Do we make up a bunch of "generic" placeholder knighthoods, assassins guilds, mercenary leagues and the like, simply to preserve that distinction, or do we add some more cool details and further flesh out organizations that people presumably already care about, and sometimes care about a great deal? With the assumption that people who don't care one way or the other will just carry on blissfully using the stuff they like and ignoring or changing the stuff that they don't--something that doesn't change whether the book uses Golarion organizations or not--we decided to go with the better-known organizations. This is an experiment. To be completely honest, there is a bit of a school of thought here that thinks the big wall between the campaign world and the rules is more trouble than its worth. This book is a test to see if that is true. I'm excited by what I've what I've seen from the book so far, and I believe it will be a worthy addition to the Roleplaying Game hardcover line. I hope (and to some extent expect) you'll feel the same way once you've had a chance to check it out for yourself. Frankly I'm all for it better to use something thats already there than make up some setting neutral version thats pretty much just it with the serial numbers filed off. And on the bright side if this was generic neutral it saves us from buying at least 3 Player's Companions covering these organizations with the new rules. RED MANTIS SLAYER ARCHETYPE & ALDORI SWORDLORD SWASHBUCKLER ARCHETYPE OR I WILL SCREAM! And its name is Paizo. I can't wait for this. That doesn't really ring true. The odd content, and the fact that it wasn't announced earlier, has a feeling of dishonesty to it, which is shocking to me as it is the opposite of Paizo's usual stance. Just tell us the truth, this is "Inner Sea Factions" renamed to fill a gap. It will probably not be in the PRD as it will contain Product Identity names. For the same reason it cannot be extended by third parties. It cannot be integrated in to non-licensed character generators. Generic is better for reusability. A series of organisations such as a Martial organisation, a knightly organisation, a secret organisation etc, which can then be referenced from other works, such as "This is a standard martial organisation with the following differences..." Shackling he whole thing to the Paizo game world completely removes this extensibility, and it is a massive missed opportunity. It should not be an RPG line book. What Erik wrote is 100% true. I happened to have conversations with him before a single word of this was written, so I don't even have to just trust the fact that Erik is an honest person to be aware of this. This is exactly the experiment he says it is. Generic is better for reusability. Generic is bland garbage. YMMV. Ooh, love the Magaambya and the Cypermages, and it might be fun to see some development of the Gray Maidens and Aspis Consortium, as something more than just adversaries. After a whole book on the Hellknights, and two books on the Pathfinder Society, I'm wondering what sort of new material would be needed for those factions. As my spate of temporary insanity in the Faction Guide product thread might suggest, I'm a big fan of this sort of thing. Hopefully a few more factions sneak in, like the Esoteric Order of the Palatine Eye, Kalistocracy, Risen Guard or Sleepless Detectives. So none of the bestiaries are of any use to you then? They are all generic in exactly the way I'm suggesting this should be. They are not generic creatures, no. A world specific collection of organisations is locked, static, it can never become more than it is. Such a collection would be bland and unfinished, and not at all useful. Cool! Whether its an experiment or whatever, I don't really care. I'm buying it anyways. I like the idea, but if I didn't, I wouldn't buy it. Its a pretty simple concept. There is a place for this product, as described it wonderfully adds on to Inner Sea Gods and Inner Sea Races. The RPG books should serve as toolboxes for further content. And this won't serve as one... how? Because nobody can expand on it, 3rd parties cannot use it because of the product identity names. It will be like in the bad old days when spell names where kept as product identity to prevent the spells being referenced form elsewhere. For a more recent example, there are some otherwise quite 'generic' archetypes for the (in-game) Pathfinder Society, but because the name is PI, the archetypes cannot be reused by other publishers for similar 'investigative' organisations. Not that, as previously, I am using 'generic' to mean 'not world specific', a 'generic' organisation can have lots of flavour, and ideally would have a discussion for each organisation type on how to generate that flavour. So you don't like it based on the fact that 3pp can't build on it, ignoring alll the building GMs and players can do with it? I'm not involved with this project, but personally, I think this was the right choice. "Generic" does not equal "more useful" to GMs and players, and doing a book like this on bland organizations would have likely resulted in a bland book of tropes. The tropes have mostly been done already, folks. I think this experiment is going to prove successful, personally. There's going to be years worth of history and passion in this book. The fact that the d20pfsrd.com site regularly scrubs off the serial numbers on content like this and no one notices is proof that this assertion isn't accurate, and I would argue that a world neutral product is even MORE likely to be locked and static because its more likely to be distilled down into generic topes—the stereotypical theives' guild, the stereotypical crusader's organization, so on and so forth. I strongly suspect that the content in this book will be useful to GMs willing to pick apart the book and apply it as they wish. Also, as a 3PP guy, I don't think I would do a world neutral book like this. Its just not interesting, and Creighton Broadhurst basically hit all of the "generic tropes" versions of this sort of thing with his Dressing series products. When it comes to generics, there is not much room for organizations. The moment you start adding bits and pieces to start deviating from the tropes, then you start creating world-specific content because we're not talking about monsters or abstract powers and abilities for characters—we're talking about groups of people, living and breathing and acting in specific ways. Once you take even one step beyond the "universal tropes," you've moved into something entirely new, and at that point why make "new" organizations when you can further expand upon the ones that we already have. Also, I think this is going to be the first time that there was ever a new release at PaizoCon. Nifty! I'm sorry if you feel that there's anything dishonest about it. The book was announced at the same time as our other May solicitations, so I'm not sure what you mean by "it wasn't announced earlier." There are more surprises coming in 2017. Starfinder is indeed throwing a monkeywrench into the cadence of regular Pathfinder RPG releases and when we announce them, but this product was announced now because now is when we're soliciting May products. It's really as simple as that. No, it's not. The focus is on character abilities and options, not on building factions or tracking influence and such within factions. The "factions" element of this book is a framework for more fun game content. I admit this is not a huge concern of mine. Sorry. We'll see. It's an experiment. I'm willing to try it out and see how it goes, because I'm certain it will be a cool book. I understand you feel differently, which is also OK.
Not once did I say that I don't like the book. I am looking forward to it, but I consider it a Campaign Setting book. I am disappointed that it has been shoe-horned into the RPG line. I am also disappointed because Paizo seem to be moving away from the 'Here is a toolbox for you to expand' approach of the previous RPG books towards the 'Here is our world, play it our way' approach across ALL of the lines. That makes my inability to attend even more painful. If they were going to make an experiment with the RPG line with adding Golarion specific stuff, then instead of organizations being the focus/theme for class abilities how about regions and cultures like Arcadia, Hermia, Tian Xia, Land of the Linnorm Kings, etc. Likely because it takes more word count to describe a continent / country that has very little written about it than an organization. I removed a post. Folks, new product announcements are exciting times. Passions can run high. Remember people's preferences vary and opinions on what makes good game content vary. We understand that some people will be very happy with this book and others will want to give it a pass. We expect this product hits a home run with many of you. Keep this product discussion thread respectful. If you'd like to debate the more philosophical questions of what this experiment might mean for Paizo Inc or the Pathfinder Roleplaying game, a new thread dedicated to those musings might be a better place than this specific product discussion thread (if you chose to do that, feel free to post a link to the thread in here for visibility). All of the non-world neutral content appears to have been scrubbed from d20pfsrd.com when they started selling their own content. For instance (as an example) the Pathfinder Delver archetype from Seekers of Secrets does not appear there - a reasonably 'generic' (as in no rules that tie it to the organisation) explorer that is locked by its PI name. To be fair, the archivesofnethys.com is a better candidate for PI content, but the owner has (for understandable reasons) not been able to keep the site up to date. But, and this is my big issue, it still prevents other publishers from reusing this content unless they replicate and rename it, which proliferates the same content in multiple, not quite the same versions. I also disagree that the generic templates for organisations are all covered by others. Paizo have, for their own organisations, a fame/favour system. This is touched upon in brief in Ultimate Campaign, but the version there is lacking when compared to the versions that appear in the campaign setting books. I think that a much expanded version of this, covering different types and sizes of organisation, with events and costs like Ultimate Campaign would from Paizo and intergrated with the rules from Ultimate Campaign would be an ideal RPG line book (And I've looked, no-one else that I can find has done this). I'm looking forward to this book. Sounds exciting, to me, even if not used in Golarion. In fact, one of my friend's and I have been talking about various organizations a character might belong to and what the organization might expect of the character and what the character can expect of the organization. So, this book sounds perfect for us. 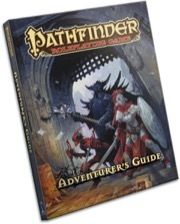 Setting-specific content has appeared in "setting neutral" books before, dating back to the Pathfinder chronicler prestige class in the Pathfinder RPG Core Rulebook. Many monsters in our hardcover bestiaries are monsters from Golarion whose world flavor is removed more for space concerns (1 page per monster rather than two in AP volumes) than protecting our IP or maintaining some wall separating "generic" content from setting content. In the same way GMs and players can leave out gunslingers, samurai, summoners, the Void domain, spells with the emotion descriptor, or falcatas,when playing their games (either in the Pathfinder campaign setting, in homebrew worlds, or in the Forgotten Realms and Ravenloft) they can just as easily use character options labeled as specific to Eagle Knights and use them for the Harpers or use Varisian spells and have them cast by a Vistani fortune-tellers. True, but, for example, the word Varisian, up until this book, does not appear in the RPG line. And if it did, for example if a prestige class was called 'Varisian Card Shark' a character in another publishers book could not have that class. I think that the fact that I could not find it and it had to be renamed sort of supports by point about the divergence of the content, with potentially different names in different places. I do have to wonder how much of this book will be a reprint. There are 18 organisations, so a 10 page spread per organisation leaves 12 pages for the front and back matter. With 10 pages for each, If they use a similar format to Monster Codex each will start with a half page picture and quote, then three pages of detail about the organisation followed by 6 pages of rules (or 1 page of information and 8 pages of rules - but that doesn't sound like there is sufficient space for the info). So, probably 3 pages of info per organisation, assuming 50% collated from elsewhere and 50% new, is about 1.5 pages of reprint per organisation. Across the whole book this is about 27 pages, or roughly 14%. This assumes that all of the rule content is new, and not reprinted from the Campaign Setting faction guides such as Seekers of Secrets, Path of the Hellknights, etc. As someone deeply involved with this book, I'm very excited. 1) Coming out one month after Bestiary 6? Not any more, with Bestiary 6 being moved one month to the left. Even this two month gap seems to be pushing it, but at least it is not as completely impossible. 2) An RPG line product with mostly Golarion specific content? Confirmed as a new experiment with that line. 3) Not a peep from Paizo about this product? Confirmed as unexpected events delaying the official announcement from Paizo. But I do hope that most of the archetypes and prestige classes are completely new and not reprints.